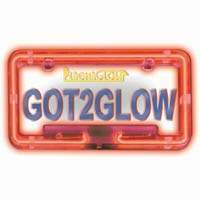 We all have to have them on our vehicles - So why not make yours a part of the vehicles overall appeal with a neon license plate frame? Whether your vehicle is aglow with bright vibrant color from our other lighting modifications or you simply want to add a little style to your ride, neon license plate frames are a must! Simple to install, these light up license plate frames can be wired to work in synch with brake lights, parking lights, or to simply glow all night! With many colors available, you’re sure to find the right Frame to match your vehicles attitude. These frames fit any standard license plate, and are perfectly legal. In fact, law enforcement actually prefers neon plate frames because it lights up that area of your car! There’s no reason not to add a little color to your car, and light up the night with a neon license frame! Check out the links below to set your car above the rest!! A light up license plate frame also make GREAT interior lights. Install them under your car seats to provide an "ALL ROUND GLOW" on the floor inside your car. Be different! $32.99USD Each. On Special This week Only Hurry! License plate frames make GREAT interior led lights. Install them under your car seats to provide an "ALL ROUND GLOW" on the floor inside your car - Offers the same color changing patterns and scanning patterns as the 2.1 Million color LED under car kit, and plugs straight into the 2.1 Million color digital control box (sold separately). Be sure to check with your State Road Laws in regards to having neon/LED lights on your Vehicle.